Burns Original Cat is a complete food for adult and senior cats. This low-fat, naturally preserved, hypo-allergenic kibble was developed by a vet and contains all eleven eΒential amino acids including taurine for healthy eyes and heart. It is suitable for all cats including those with sensitive skin or sensitive digestion. Original Cat is a holistic, top quality food which provides your cat with everything it needs to stay healthy. 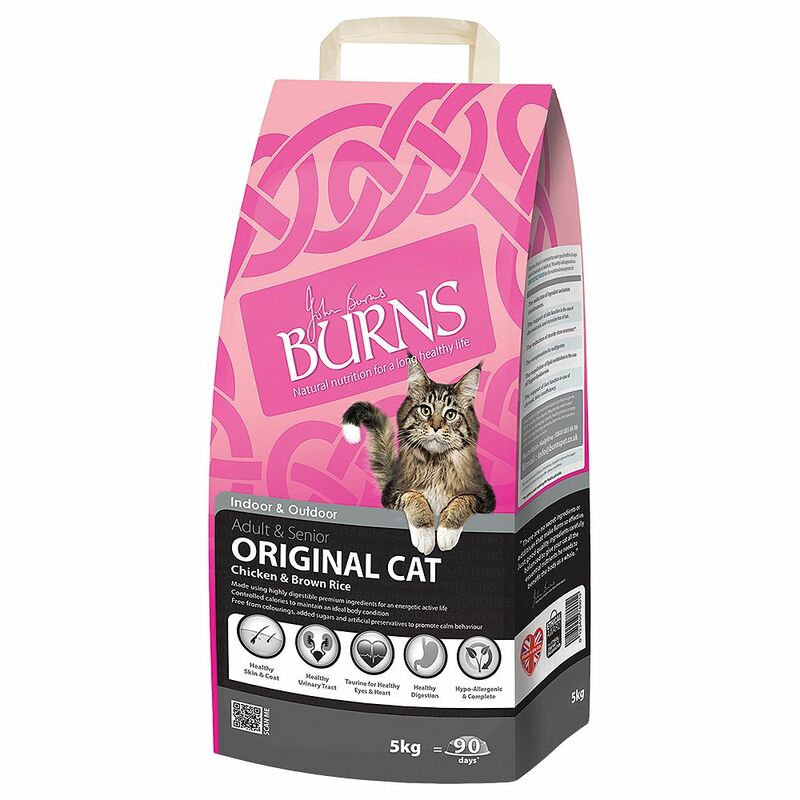 Burns Original Cat is made with top quality chicken or fish for healthy protein, it is rich in B vitamins and whole grains. Controlled levels of protein and minerals help maintain healthy kidneys and urinary tract. It is formulated without beef, dairy or wheat and provides your cat with a holistic, balanced meal. Burns Original Cat at a glance: Complete dry food for cats of all ages, including senior cats Holistic cat food Hypo-allergenic: especially suitable for pets with allergic reactions Developed by a veterinary surgeon Low in fat and protein Supports a healthy digestive system Contains no wheat, beef or dairy Encourages supple skin and shiny coat Supports a healthy urinary tract With taurine for healthy eyes and heart Suitable for cats with sensitive tummies Made in UK Burns Original Cat Economy Packs 2 x 15kg are available in the following varieties 2 x 5kg Chicken and Brown Rice 2 x 5kg Fish and Brown Rice 2 x 5kg Mixed (1 x 5kg Chicken and Brown Rice, 1 x 5kg Fish and Brown Rice) Please click on this link for further information on the different varieties: Burns Original Dry Cat Food.